The Oracle database server records all user information and transactions. The high storage capabilities of the server eliminates the need for a conventional filing system, providing a better and paperless working environment. It is possible to install FTDP to work with Oracle so that 3rd party software plug-ins can access the transaction data with ease. Read more to see the step-by-step guide to install FTDP with Oracle Database. 1. Create a table space in the Oracle database for FTDP storage size 200MB. 2. Create a user or link the existing user to this table space. 3. Configure Oracle Local Bet Service Name Configuration on the PC. 4. Go to Windows > Control Panel > Administrative Tools > Data Sources (ODBC). 5. For Windows 7/Vista/8 64 bits, go to C:\Windows\SysWOW64\odbcad32.exe. 6. 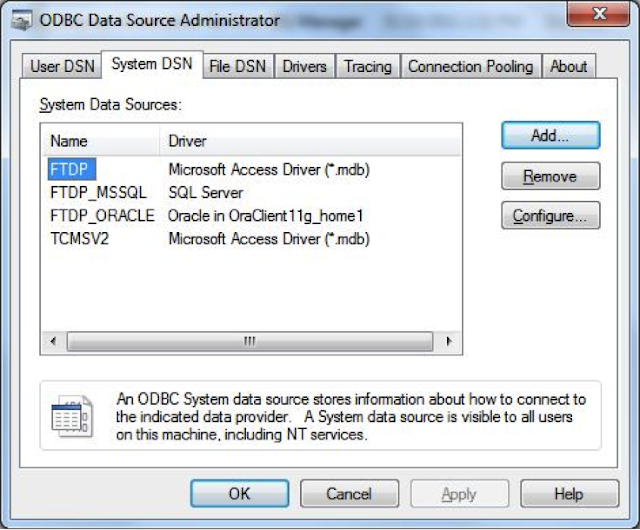 Open up Data Sources (ODBC) > System DSN tab. 7. 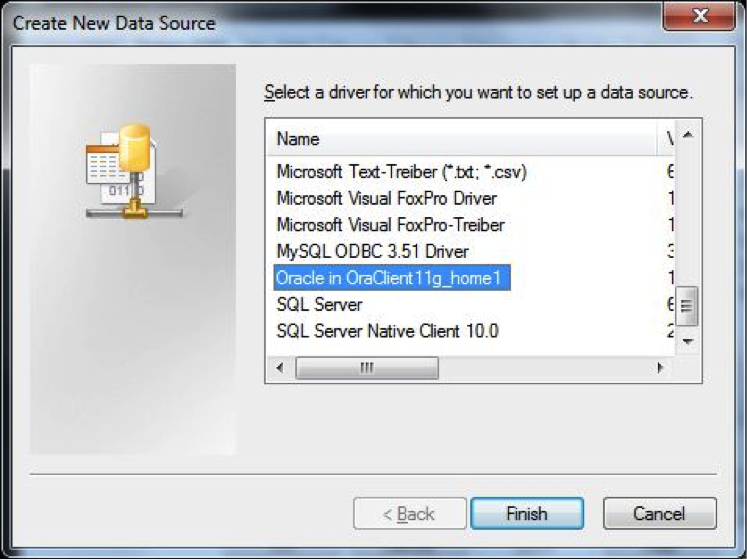 Add a new data source, select the Oracle driver and click Finish. 8. 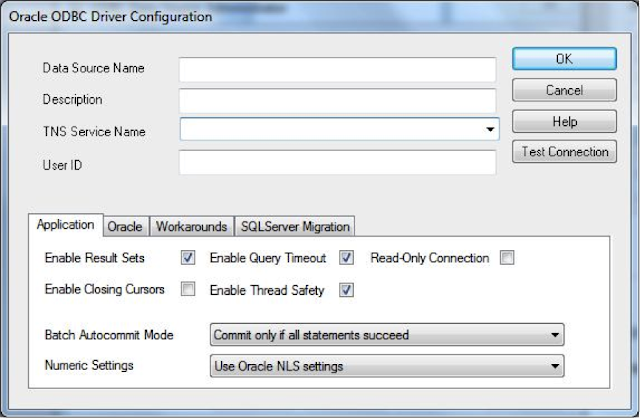 Input a new Data Source Name, select the TNS service name, key in User ID and click on Test Connection to make sure the connection to the Oracle database is successful. Click OK to save. 9. Go to Start > All Programs > FingerTec > FingerTec Data Processor > Database Initialization Tool. 10. Select Oracle, key in TNS Service Name, UserName, Password and Table Space name and click Connect to connect Oracle database. Continue by clicking on Initialize, and wait until the Oracle database initialization is complete. 11. Double click on FingerTec Data Processor, key in your password and login. 12. Go to Configuration > Database Setting, select the FTDP Oracle data source, key in its User name and Password, tick Allow saving password and click on Test Connection to make sure the connection to Oracle database is successful. Click OK to save and exit. 13. Restart the FTDP application and voila! Now you have successfully connected the FTDP application to the Oracle database. You can't directly download the clocking data from the FingerTec terminal into your third party software. You will need to use the FTDP software as a bridge by switch the database from Microsoft Access Database to the Oracle Database using ODBC setting. Please if you have a detailed screen shots will be helpful. 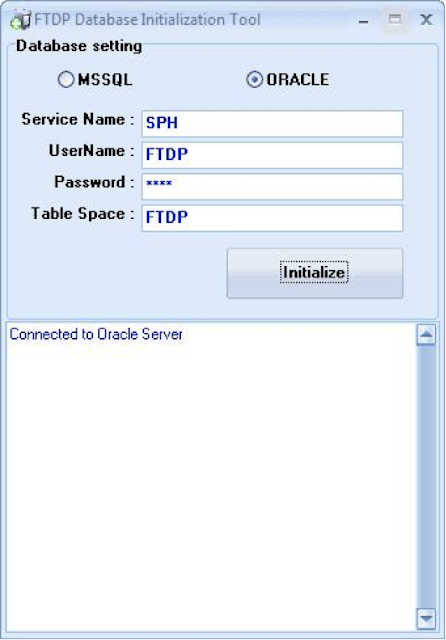 For your information, the step shown above is the way to transfer the data downloaded from Fingertec devices into FTDP, and straight away into Oracle database, same as your requirement. Hence please follow the steps shown above accordingly, and to which table the data is stored in Oracle, depends on how you configure the Oracle. You can refer to the above comment for the FTDP table names. and the data it stores. Once i created a new employee in Oracle HRMS, it will be automatically visible in Fingertec. Will you pls help on the steps on Post connectivity. How it will be transfer to Fingertec database? What are the columns are required from my Oracle employee table to your db? Is there any scheduler which we need to be configured? And what is the process for disable the employee in fingertec once employee terminated in Oracle HRMS. after 20 days not downloading to oracle database. unless i have to remove the old attendance data from database. then only downloading from the device. usb upload option not working for oracle database. Referring to your problem, please brief us more details regarding to your problem by email to us at support@fingertec.com. If possible please attach in the email any supporting document like screenshot picture or the error message for better understanding and reference. Regards. 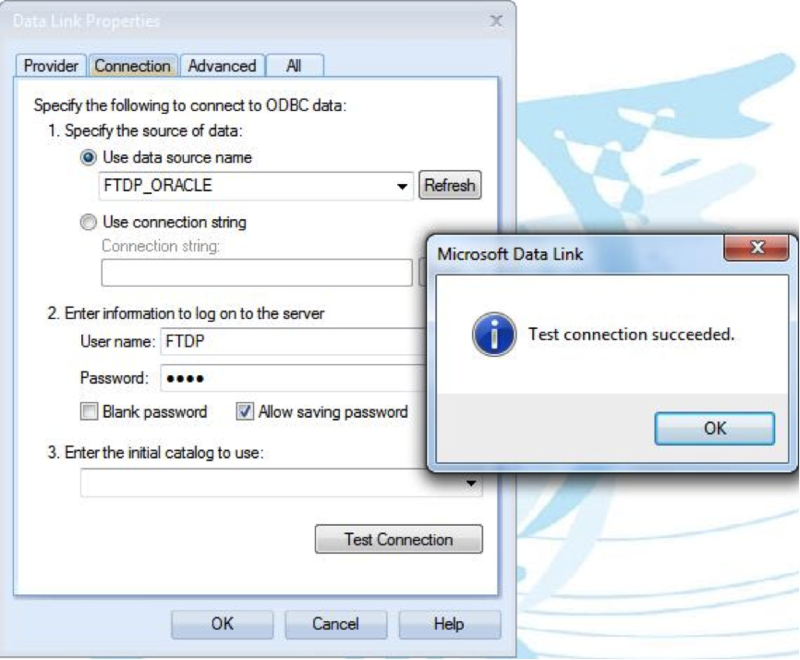 Referring to the problem and for your info, we have run a testing using default FTDP database (Microsoft Access Database) and found there is no issue to integrate and connect the database with FTDP. In this case if you change the database to MSSQL or Oracle database, you will need to check the issue at the ODBC integration or your current database itself. If there is any error message or problem during the integration kindly share with us the screenshot picture or any supporting document and email to support@fingertec.com for our reference to doing the checking. Thanks. Pls any one can you help me. i do all configuration which shown above and when open FTDP program it display this error "there is no table or veiw"
Regarding your query, please provide us screenshot on your error message so that we can check from our side and refer to our programmer on this issue. You may email to support@fingertec.com for further inquiries. May I know the exact device serial number for the device that can not be connected to our Fingertec software? The serial number can be found in the device's menu (Menu > Sys Info > Device > Serial Number, or you can check it at the back-side of the device (7-digit serial number).